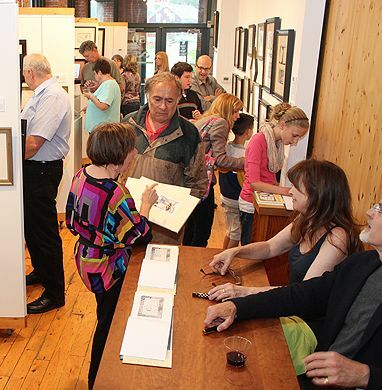 We had a great time at our gallery opening and have some pix to show. We'll also take this opportunity to catch up and show you some of what folks have been sending us recently. In our previous newsletter we explored a grid-based idea of tangling. Since then, we've been blown away seeing what you've done with that idea. Take a look at the contributions at CZT Laura Harms' iamthediva's Challenge #122 to see some amazing examples. Tangler Anneke van Dam from Holland was inspired to share this link to another grid pattern that you'll want to check out and play with. 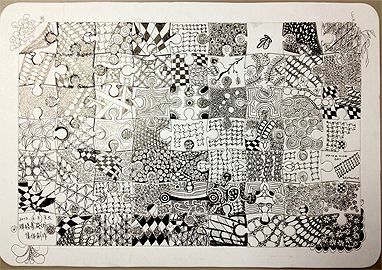 It's always exciting to see the creativity and ideas that resonate inspirations within this Zentangle community. 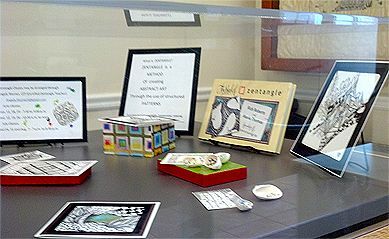 After arranging to teach classes at the West Hartford Public Library, Angela Werner, CZT, was requested to do a gallery display for the library and also decorate their display case. Her summer classes all have waiting lists now and the local TV station has scheduled her for an interview! 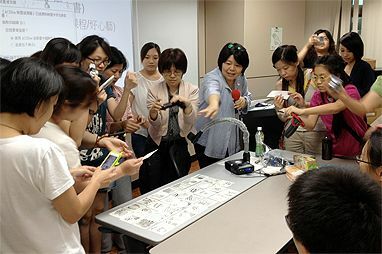 On another part of this world in Taiwan, Laura Liu, CZT, collaborated with a local college and publisher to present Zentangle to their students and readers. 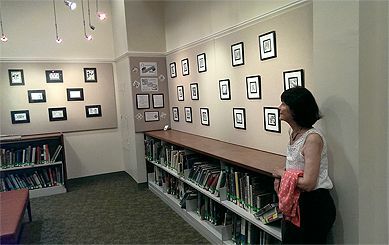 We had a great time at our gallery opening on June 7 at Alternatives in Whitinsville, Massachusetts. 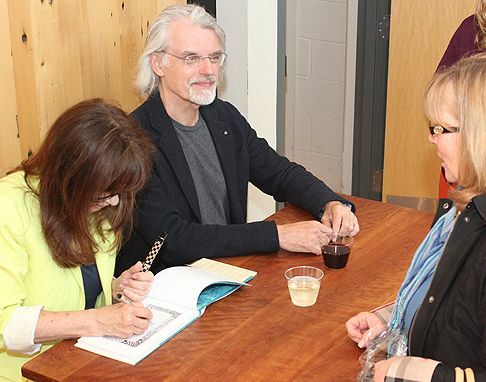 We signed lots of books to benefit Alternatives . . .
. . . and in spite of the rain, we had a great turnout. We are grateful to Alternatives for hosting this show. It will be there for about two months. If you're in the area, please make a point to visit it. 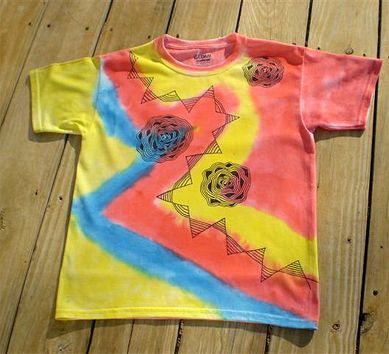 Just received your newsletter which reminded me to send you this picture of a tee shirt that I designed for my eight year old grandson. It was great fun creating the design and my grandson just loved it!!! Looking forward to seeing you in June! Zentangle has opened up a whole new world to me and I can't wait to meet you and learn more and more about this satisfying art form. I had this idea for an art project at school. We each had to choose a theme for the year; I chose folk lore. I researched folk lore from many different cultures around the world. For this project I based it on the Namazu, a giant catfish that lives in the mud under the islands of Japan, and is guarded by the god Kashima, who restrains the catfish with a stone. When Kashima lets his guard fall, Namazu thrashes about, causing violent earthquakes. I hope you like it! 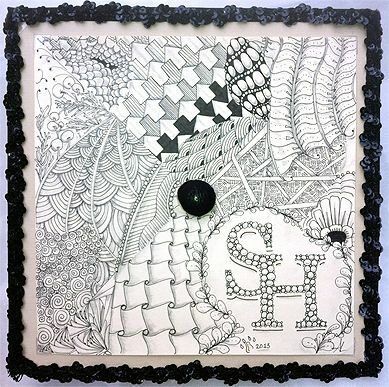 My friend created this beautiful art for my college graduation from Sam Houston State University. My favorite part is the arrows leading to and away from the SH logo of my university. The arrows grow with intensity a they get closer, but there is a crumbling crater in their path: the distractions of life that caused 17 years to elapse between my freshman year and my graduation. I love this zentangle so much!! This is a piece I made using glass. 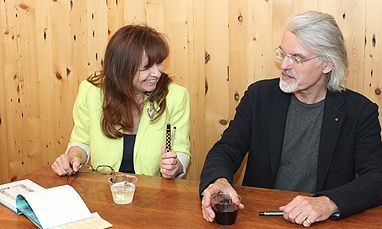 The 'penned' designs are done using vitreous paint (paint made of glass) and are permanently fired onto the glass. 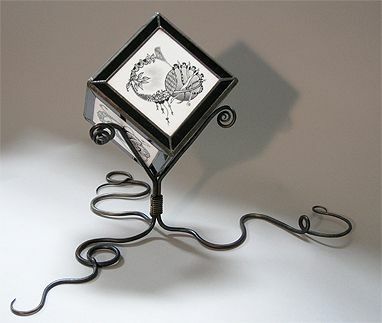 I saw the work of blacksmith, Ken Thomas, and loved the way he was able to work steel into sinuous tendrils and so suggested a collaboration. I think the result is nothing short of magical. In this sculptural glass 'cube' each side has a different design and the cube is repositional so that each side can be viewed at the discretion of the viewer. There are no words that can adequately express the gratefulness for the inspiration (to breathe in spirit) that you have shared. Not only that but I believe you have, through your art, struck on the single chord that metaphorically explains to people just how to understand and deal with the complexity(ies) of this complex and difficult time in which we live. Thank you to all of you who continue to share your beautiful creations and adventures. We've posted larger versions of these images on the companion blog of this newsletter. Thanks again for sharing in this wonderful adventure with us.